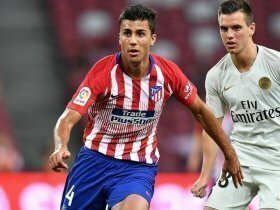 Manchester United could reportedly offer competition to Manchester City in the race to sign midfielder Rodri from Atletico Madrid in the summer. The Spaniard has been closely watched by the Citizens since the turn of the year and a recent report has suggested that they could be prepared to match his £60m release clause to lure him from Atleti. However, Marca claims that the Premier League holders could face strong competition from some of Europe's elite clubs and this includes the likes of Manchester United and Paris Saint-Germain. United are currently facing the prospect of losing Ander Herrera on a free when his contract expires in the summer and it appears that Rodri has been earmarked as a high-profile replacement, who could stay put for years to come. Fred was widely expected to cement a midfield role after his £52m switch from Shakhtar Donetsk last summer, but so far, he has not sufficiently impressed to command a regular spot from the starting XI.